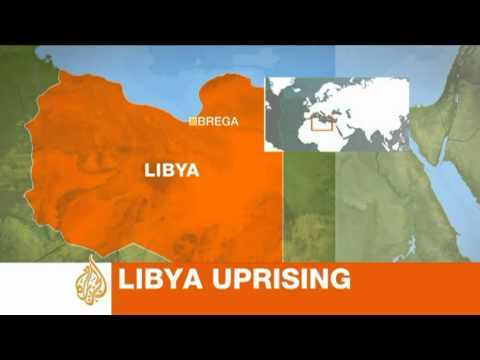 Aljazeera English reported on the Battle of Brega just as it was concluding on Wednesday afternoon, describing relatively ineffectual bombing raids by Tripoli even as partisans of the liberation movement pushed pro-Qaddafi troops out of the city. The BBC is reporting that Qaddafi’s forces were numerous and well-armed, and had intended to take Brega first and then roll on to Ajdabiya. The less well-armed pro-Benghazi forces nevertheless contained many ex-military and had superior esprit de corps, and reinforcements from Ajdabiya allowed the Brega citizen militia to beat off the attackers. Aljazeera English reports that people in Brega and Ajdabiya very much want a no-fly zone to be established by the outside world over Libya to remove the threat of air attacks from Tripoli. In contrast, the pan-Arab press outside Libya is extremely critical of the idea of Western intervention in Libya, even where it is virulently anti-Qaddafi. Qaddafi’s willingness to bomb his own civilian population from the air is being likened by the Saudi newspaper al-Iqtisadiya [The Economy] to Israel’s routine use of bombing against the Israeli-occupied Gaza Strip. This comparison seems to me extraordinary and a sign of how unpopular Qaddafi is among Arab intellectuals and in the Arab public. The attack by pro-Qaddafi forces on Brega underscores the contest between the Tripoli government and the Benghazi rebels over Libya’s petroleum revenues. Qaddafi’s hopes of surviving and of reconquering the east depend heavily on his access to monetary resources. With many of his assets abroad frozen and his banks closed, and 80% of the petroleum fields and facilities in rebel-held territory, he is not well-positioned for a war of attrition. Hence the attempt to retake Brega quickly. As in Iraq under the oil embargo of the 1990s, likely gasoline and kerosene will start being simply smuggled by Qaddafi’s forces, to provide him a lifeline. It is not lucrative to smuggle raw crude, so the real question is Qaddafi’s control of refineries. Gasoline, once produced, is easy to transport and has a high value, so it is ‘fungible’– easily exchanged for cash anywhere, and gasoline is increasingly the hope for revenue of both sides. According to the LAT, the Benghazi rebels say that they don’t need the petroleum revenue to function, since the regime had not earlier been spending much of it in their region anyway. But this assertion is mere bravado. If the standoff between east and west Libya continues, they will need to purchase arms on the international market, and will need big money to do so. Aljazeera English reports that the strength of Qaddafi’s military has been over-estimated. For instance, his jets seem mostly not to be able to fly (sophisticate jets even in the West spend as much as 50% of the time being repaired and serviced on the ground, out of service, and the proportion is likely much, much higher in Tripoli). Only a few planes have flown missions against the rebels.